Selective breeding for desirable traits inevitably also concentrates potentially harmful genes. Like all other breeds, the Labrador has its own variety of inherited medical problems. The primary clinical conditions involve the joints, eyes, and brain, with obesity often an additional problem. Although partly hereditary, this condition can also be related to excessive weight or over – vigorous exercise during puppyhood. Signs of hip dysplasia include high muscle wasting and discomfort on rising. In severe cases, dogs “bunny hop” to diminish pain. Veterinary associations and kennel clubs have developed useful hip – testing schemes. Normal hips the hip is a basic ball – and – socket joint. In healthy hips like these, the head of the femur (ball) sits comfortably and firmly in the acetabulum (socket) of the hip bone. 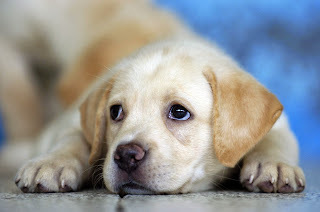 Labrador Retrievers can suffer from a variety of inherited eye ailments. Breeding stock should have their eyes routinely examined for detached retinas, cataracts, and any sign of diseases such as entropion, retinal dysplasia, and progressive retinal atrophy – a later – life blindness in which the retina “dies”. It will soon be possible through DNA blood “fingerprinting” (as it already is with Irish Setters) to detect individual carriers of the genes that cause hereditary eye disorders. Clouding of the lenses this dog has cataracts, with obvious loss of transparency of the crystalline lens in each eye. The condition is painless, but clarity of vision is severely impaired. All conscientious breeders participate in accredited screening programmes, often jointly run by kennel clubs and veterinary associations, and will be able to provide relevant certificates stating that a dog is clear of inherited eye disorders, and giving a comparative rating for any hip abnormalities. In a number of countries, anatomical, behavioral, and hereditary factor surveys are carried out by breed clubs, with dogs classified as “recommended for breeding”, “suitable for breeding”, or “not suitable”. Although Labradors generally have robust constitutions and sound physiques, they are nevertheless susceptible to certain medical conditions. Some are inherited and cannot be prevented, but treatment may help to alleviate symptoms. Always keep your dog at a healthy weight; with their stocky build and hearty appetite, Labradors can easily become obese. Osteochondorsis the increasingly diagnosed disease, in which areas of joint cartilage “die”, is particularly prevalent in the larger breeds, and usually first affects puppies between four and eight months old. It may occur in any joint, but Labradors suffer most frequently in the elbows, showing pain – induced lameness, leading to arthritis in later life. Implicated causal factors are genetic make – up, hormone imbalance, diet, exercise, and growth rate. Treatment for the condition, identified by X-ray, often involves surgery. Deafness and Epilepsy deafness is not uncommon in elderly Labradors, as nerve transmission to the brain gradually deteriorates. Epilepsy, another inherited condition, although far rarer, is distressing for both you and your dog, and requires veterinary attention. “Depraved” Appetite Labradors love food, and can sometimes develop a “depraved” appetite, trademarked by the eating of Faeces. This distasteful habit may be caused by an enzyme deficiency. If so, supplement the diet with papain – rich pineapple, papaya, pumpkin, or vegetable marrow. Laryngeal Paralysis incidence of this old – age illness is higher in Labradors than in all other breeds combined. Its symptoms are very obvious: loud, distressed breathing, coughing, and a muted bark. It is caused by the larynx (voice box) collapsing over the windpipe, reducing air supply; the only cure is by surgical correction.